For use in liquid fertilizer formulations containing nitrogen and other nutrients. 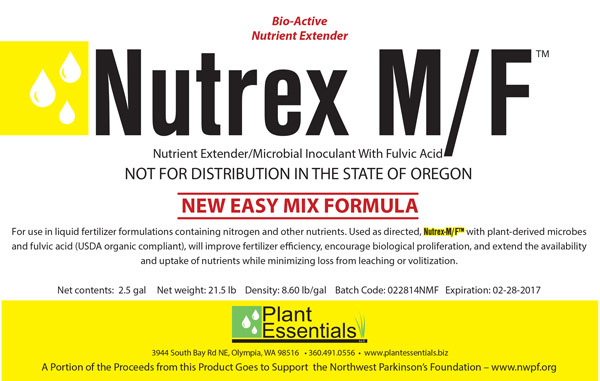 Used as directed, Nutrex-M/F will improve fertilizer efficiency, add beneficial microbes and stimulate biological proliferation, extending the availability of nutrients for root uptake while minimizing loss to the atmosphere and leaching. When added to urea or ammonium sulfate, the nitrogen release is extended and predictable without regard to temperatures or rainfall. USDA organic compliant microbes, fulvic acid-carbon amendment, Ascophyllum Nodosum from brown seaweed, Dicyandiamide, N-(n-butyl) and Thiophosphoric Triamide (organic nitrogen compounds). Nutrex-M/F is a liquid suspension comprised of ingredients derived from organic nitrogen compounds and brown seaweed, fulvic acid-carbon amendment derived from Leonardite, and strains of plant sourced microbes, our SoilSeeds product. excellent tank mix partner for liquid root treatments, being compatible with other fertilizers and root rot fungicides. The addition of fully chelated Supertrace 6% Iron will give rapid color response and supply beneficial micro-nutrients for increased soil and plant health. Savings of over $2.00 1000/sq. ft. are possible with Nutrex-M/F and urea or ammonium sulfate over a mix of urea and other popular liquid slow release products. One company reported they saved enough money in two seasons to buy a new truck ($25,000!) after switching to Nutrex-M/F. Their techs liked it better because they didn’t have to handle gallons and gallons of the other heavy, sticky product, and they got the same, or better, nitrogen release. In addition, the added fulvic acid and microbes gave them a true bio-fertilizer that has an impact that can be observed. And, as you know, when the techs are happy, everybody’s happy.